Today at Heerema Zwijndrecht the 11,000-tons BP Valhall main deck leaves the fabrication hall. Heerema Zwijndrecht, one of the three production locations of Heerema Fabrication Group (HFG), today reached a milestone in the construction of the Valhall Re-Development Integrated Production &amp; Hotel Facility deck for BP Norge. As maximum fabrication height has been reached the 11,000-tons weighing topsides leaves the extensive fabrication hall at Heerema Zwijndrecht for further completion outside. Heerema Zwijndrecht was awarded the fabrication and integration contract in March 2007 of the 11,000-tons weighing Integrated Production &amp; Hotel Facility topsides together with the 350-tons flare boom structure of which fabrication started in November 2007. Additionally, at 23 June 2009 Heerema Zwijndrecht received the award for the fabrication of the 2,000-tons Weather Deck module. Although Heerema Zwijndrecht’s facility has a capacity which ranks amongst the largest indoor facilities in Europe, due to limited space the unit has to be moved outside to fully complete the topsides. 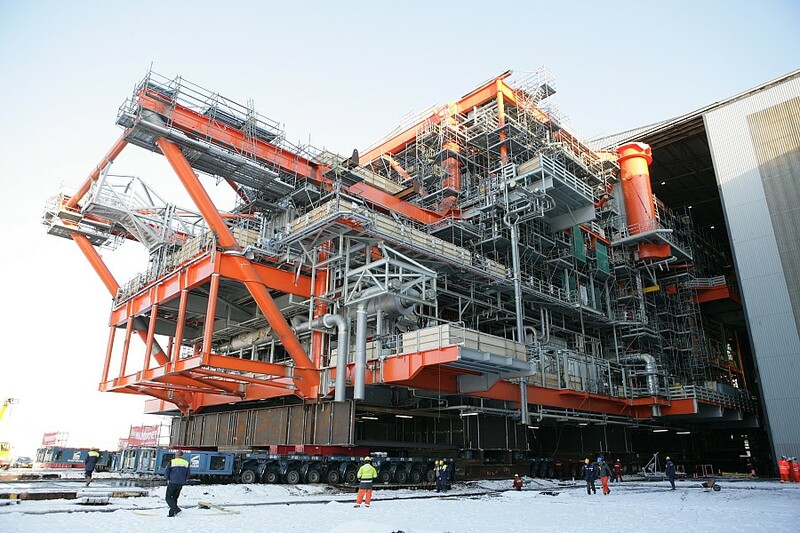 The BP Valhall main deck will measure 100 meter in length, 47 meter in width and 50 meter in height. It is expected that all the structures; main deck, weather deck module, flare boom as well as bridges 1and 2 will leave the Heerema Zwijndrecht location in May/June 2010 for their final destination offshore Norway. Once completed the topsides will have a weight of over 13,000-tons, excluding Power-from -shore module and Living Quarters. Heerema Fabrication Group (HFG) is headquartered in Zwijndrecht, the Netherlands. HFG offers innovative, cost effective and high quality engineering and fabrication solutions for offshore structures to the global oil &amp; gas and energy industry. HFG owns three large fabrication locations of which two are situated in the Netherlands (Vlissingen and Zwijndrecht), one in the United Kingdom (Hartlepool) and a workshop facility in Poland (Opole). Furthermore, HFG owns a multi-disciplined engineering company with offices in the U.S.A. (Houston and New Orleans) and the Netherlands (Zwijndrecht). Heerema Fabrication Group employs over 1,100 people. HFG is part of the Heerema Group.